Why Are Hamsters Called Hamsters? Hamsters are interesting and mysterious creatures, to be sure, but how on earth did these small, furry, incredibly cute rodents ever get tagged with the name "hamster"? They look nothing like pigs, so where did the "ham" come from? As is the case with so many other names, the road leading to "hamster" is long and winding. Historically, different hamster breeds inhabited many regions of Eastern and Central Europe and Asia. Hamsters that now live in North American and Western European homes all derived from these ancient hamsters. In each of the lands where hamsters originated, the breeds were given local names that generally related to a characteristic of the species. Over time, many of these names changed slightly and some were picked up by other cultures. Eventually, English speakers adopted the word "hamster" as the accepted term. In the area around Iran, Iraq and Syria, the breed now known as the Syrian hamster was abundant for centuries. In Avestan, an ancient language from Eastern Iran, the small creatures that flourished and may have caused some problems for farmers and merchants were referred to as "hamaestra" or "hamaestar," which meant "oppressors" or "oppressor," according to the Merriam-Webster Collegiate Dictionary. Hamsters also were plentiful in Eastern Europe and the Balkan region. The Online Etymology Dictionary describes the Old Slavic or Russian term for hamsters as "chomestoru," which evolved into the Old High German term, "hamustro," meaning "corn weevil." This, in turn, evolved into the Middle High German term, "hamastra," which eventually became the German term, "hamstern," meaning "to hoard." 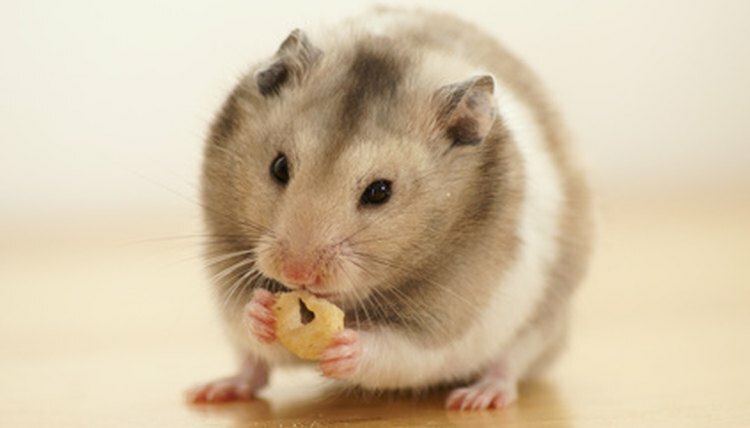 This term makes sense if we consider the fact that hamsters carry -- or hoard -- large amounts of food in cheek pouches. As Rob Dunn reported in the March 25, 2011 edition of Smithsonian Magazine, the idea of giving hamsters a name that is associated with "hoarding" a large amount of food in facial cheeks also turned out to make sense in the Arabic-speaking world. According to Dunn, a biologist named Israel Aharoni was searching, in 1930, for a "rare golden mammal" living in the "hills of Syria" whose Arabic name translated as "Mr. Saddlebags." The mammal turned out to be what we now call a hamster, the rodent whose cheeks resemble saddlebags when full. Where Did Siberian Hamsters Come From? What Is the Biggest Rat in the World? What Kind of Rodent Has No Tail?